Are there different sizes on offer? Any size can be ordered – e.g. small, medium and large..
Can I choose my own colours? Yes, the bouquets are all custom made especially for you and your own ideas are very welcome. Would I be able to send you some of my own brooches? 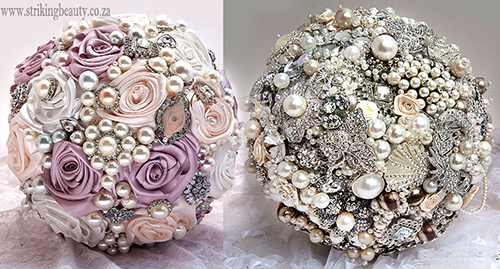 Yes with pleasure – your own brooches can make your bouquet very special. Are there a variety of shapes and styles? There are many styles and shapes e.g. round, posy, heart shape, cascading, crescent, satin flowers, fully jeweled, partially jeweled, hydrangea flowered base, roses, silk arum lilies and flowers etc. All to suit your taste and budget. How long will my bouquet take to make and when can I expect it? Please give me as much time as you can to make it – from 1 to 12 months – but I can do rush orders if requested. Would I be able to view my bouquet before receiving it? Yes absolutely – I will send you detailed pictures when finished. How do I start to order my bouquet? After e mail discussion and acceptance of ideas etc. a 50% deposit will be accepted to start ordering items etc. and the bouquet will be timeously started with reference to your wedding date. You can have it in advance or nearer the wedding date. How do I receive my bouquet? Your bouquet can be safely couriered to your door and all bouquets have arrived in perfect condition – or if I live nearby we can meet.The couriers are very reliable and I will give you a courier number. It is easier to courier these days than drive yourself. Will my brooch bouquet be unique? No two bouquets are ever the same – they are custom made especially for you. Can I have matching, corsages, hair pieces, garters, wrist corsages etc? Yes, absolutely – I can make these items to match. Can I pay my brooch bouquets off in instalments? Yes, arrangements can be made to suit you. Do you have any finished Brooch Bouquets for immediate sale now? Yes I have some really unique and beautiful ones - please see photos with prices at the end of the gallery pictures.